The Catholic Church officially proclaims individual believers as “saints” or “blesseds” for their lives of exceptional commitment to God and love of neighbor, but the word “saint” is actually much broader in meaning. “Sanctity” means holiness, and the Church asserts that all men, women, and children are holy for they bear the image of God. All Christians are guided by the hope that they might help build up God’s Kingdom on earth and one day they might live with Christ in the heavenly kingdom. Those Christians whose lives are exceptionally exemplary and who have been shown to have interceded miraculously on behalf of others may be beautified and canonized by the Church. 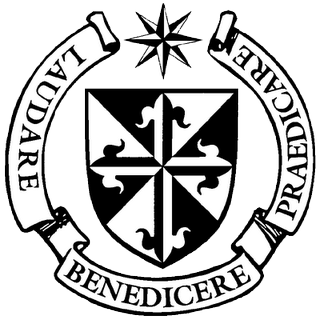 The Dominican Order has a long tradition of recognized saints (individuals who have been canonized) and blesseds (individuals who have been beautified). Dominican saints include the founder of the Order himself, St. Dominic de Guzman; the world’s most renowned theologian, St. Thomas Aquinas; and others who have lived lives of exceptional charity, such as St. Martin de Porres and St. Catherine of Siena. For a complete list of Dominican Saints and Blesseds, with biographies and feast days, click here. Born in Old Castile, on the border of Christian Spain, Dominic de Guzman studied at the University of Palencia and was ordained as a priest. Soon after, he joined the chapter of Augustinian Canons at Osma. Dramatic Social Change. The 13th century was one of drastic change: feudalism was weakening, towns were growing, and a new economy was being established. With this new economy came new ways of living which called the Catholic Church to develop new ways of preaching the gospel. Dominic and the Friar Preachers would play critical roles in this transition. Reaching the Heretics. Dominic’s life work began in a most unanticipated way: Traveling with his bishop through France to arrange a marriage, they found the majority of the people had adopted heretical beliefs. Dominic knew the Church had to challenge the heretics in a totally innovative manner; other attempts had tried and failed. The bishops had tried to preach to the townsfolk, but their regal dress and demeanor, as well as the excesses of the Church, often lost the argument for them. The heretics, on the contrary, lived simple, chaste lives, following the example of Christ. Their preaching was direct and their sincerity was evident. Innovative Preaching. Dominic decided that he and the friars would also emulate the life of Christ, traveling, having no belongings and begging for their daily sustenance. They would depend solely on the Providence of God, their lives giving testimony to their authentic preaching. Preaching in people’s homes, on street corners, and in the countryside, they would bring the gospels directly to the people. It worked! Commissioning the Order. The Pope commissioned the Order in 1216. Continuing to innovate, Dominic instituted a democratic form of governance in a time when Europe was ruled by monarchies. Dominic’s vision and devotion attracted many saintly and talented men and women through his death in 1221. Pope Gregory IX canonized Dominic in 1234. Continued Growth. In its first 100 years, the Order grew to 30,000 members from across Europe. Members of the Dominican Family are now found in over 92 countries and continue to bear the fruit of an active apostolate—one that joins contemplation to ministry to others. If you are among those who think science and religion were at odds during the medieval period, you have yet to be introduced to Saint Albert the Great. Dubbed “The Great,” by his contemporaries because of the scope and depth of his learning, he was recognized in his own lifetime and for centuries that followed as an authority on physics, geography, astronomy, mineralogy, chemistry, and biology. Becoming a Dominican. Albert, the oldest son of the Count of Bollstadt, was born in 1206 in southern Germany. At the age of 16, while studying at the University of Pauda, he heard Blessed Jordan of Saxony’s remarkable preaching and was drawn to join the friars. Albert never found his religious calling to conflict with the study of Aristotle and the natural sciences, since he viewed all nature as part of God’s created order. Scientist and Theologian. Albert taught at the universities of Cologne and Paris, where he continued in the dual role of scientist/theologian. Authoring 36 volumes on the natural sciences, Albert has been referred to as the “Father of the Natural Sciences.” Pius XII proclaimed him the Patron of Students and Researchers of the Natural Sciences. His expertise in theology was also recognized. In the late 1250’s, he was appointed the pope’s personal theologian and canonist. He also served a few years as Bishop of Regensburg at the request of Pope Alexander IV and then returned to teaching. In 1274, despite his failing health and shock over the death of his former student, Thomas Aquinas, Albert took part in the Council of Lyons, applying his influence to the reconciliation of Orthodox Catholics with the See of Peter. Death and Canonization. St. Albert died at the age of 73. He was beatified in 1622. In 1931, Albert was canonized and named a Doctor of the Church by Pius XI. 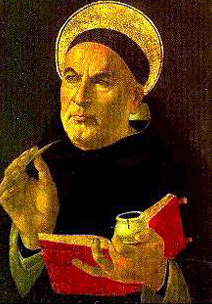 Born to a noble family in 1224, Thomas Aquinas’s life had a specific plan: he would study at the Benedictine monastery of Monte Cassino, be ordained, and rise to a position of importance. Joining the Friars. This plan started to change when the Benedictine abbot sent him to continue his studies at the University of Naples. There, he encountered the Dominican friars and soon took his vows. As he was on route to Rome, his mother insisted his brothers kidnap him, fearing he may have been too hasty in his decision. Thomas was confined at home for almost two years as the family tried to dissuade him from his chosen path. Their efforts were unsuccessful, however; Thomas convinced them he should, indeed, be a Dominican, and he was allowed to return to the friars. The Summa Theologica. In 1245, the Dominican superiors sent Thomas to the university at Cologne to study under Albert the Great. He would himself become a great teacher, seeking truth and sharing his quest and conclusions with others. Exploring the theological and philosophical perspectives of his time, the arguments he framed in the Summa Theologica would prove to be foundational to Western society. Although we may not realize it, our worldview is grounded in Thomas’s arguments. The “Mixed Life.” Among his many great insights, St. Thomas explored what he saw as a fundamental drive toward relationship—God seeking relationship with Creation and humans seeking relationship with God. As we strive to understand life at its deepest level and related to the divine, our love for God and neighbor deepens. This is the “mixed life,” a life in which contemplation of God leads us to active love of brother and sister. This is the life Dominicans still follow today through liturgy, private prayer, study, community service, social justice activities, teaching, and preaching. Death and Canonization. Thomas died on March 7, 1274. He was canonized on July 18, 1323, and was later declared Patron of all Catholic universities, colleges, and schools by Leo XIII (August 4, 1880). 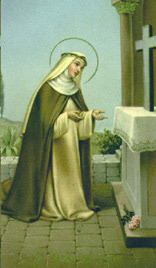 The 23rd child of Jacopo and Lapa Benincasa, Catherine of Siena was strikingly pleasant and strongly independent. This independence would be her hallmark. Becoming Dominican. At age seven, Catherine announced she wanted to join the Dominicans. When her family later insisted she marry, she cut off her hair to make herself less appealing to potential suitors. Her father eventually relented and allowed her to join the Mantellate, women who, directed by a prioress, lived in their own homes, serving those who were poor and sick in their communities. Catherine based her life of service in prayer and contemplation. Over time, her vital connection to God became evident, drawing people to her and increasing her public influence. The Dialogue. Catherine’s letters were striking, but perhaps best remembered out of her writings is The Dialogue. Her spiritual director called it “a dialogue between a soul who asks the Lord four questions, and the Lord himself who replies to the soul, enlightening her with many useful truths.” It continues to enlighten readers today. Death and Canonization. Catherine died on April 29th, 1380, at the age of 33. She was canonized by Pope Pius II in 1461. Born to Gaspar Florez and Mary Olivia, Spanish immigrants to the New World, St. Rose of Lima was originally baptized “Isabel.” Her family soon began calling her “Rose” because of her remarkable beauty, and she officially took that name at her Confirmation. Rose determined at an early age to dedicate her life to Christ Jesus. Her dedication would later lead her to denounce her own beauty and all the transient things of this world, since they could distract her from communion with the divine. Joining the Dominicans. 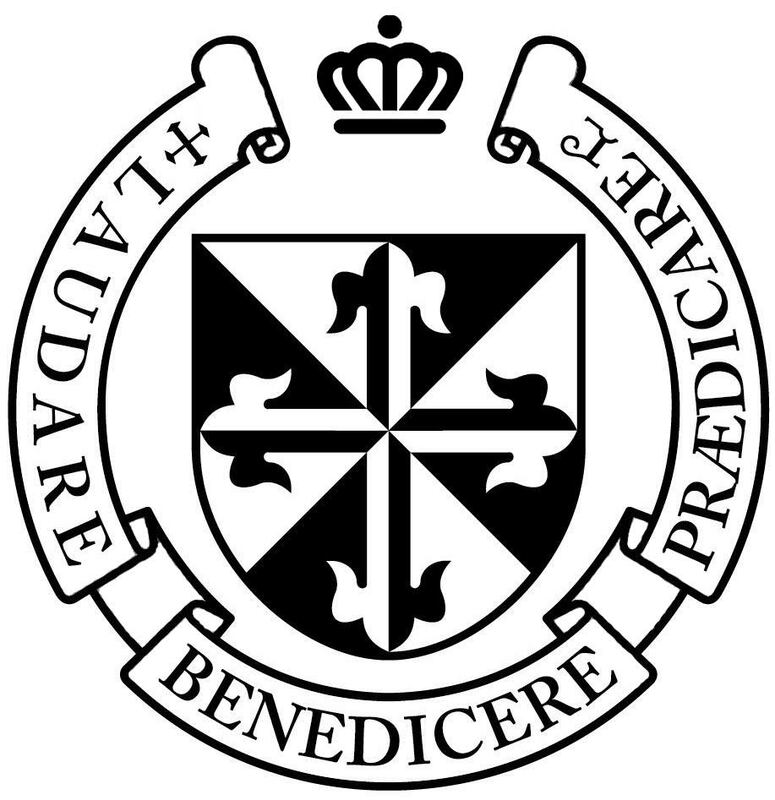 Rose joined the Dominicans at the age of twenty, as a member of the tertiary order. As such, she was not cloistered, but lived at home, praying, meditating, working in the family garden, and making embroidery items that were sold to assist her family, with any surplus earnings going to the poor of Lima. With the help of her brother, she built a small shelter in the back of her parent’s property to allow for greater solitude; in time, she retired to that shelter exclusively. A Life of Service and Prayer. Rose lived out her life, fasting, praying, and contributing to the welfare of her family and the poor of Lima through the sale of her embroidery. She practiced various self-imposed mortifications, severities adopted by some Christians as a form of purification, atonement, and imitation of Christ. She would later exhibit gifts of the mystic and visionary and would also bear invisible stigmata. Death, Beatification and Canonization. Many miracles were reported following Rose’s death in 1617. In 1667, she was beatified by Clement IX, and in 1671 was canonized by Clement X, making her the first American to attain and be recognized for this level of spiritual development. Helpful info from the St. Joseph Province. Each date clicks to a short explanation. 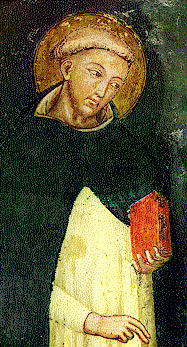 1170 Dominic de Guzman is born in Calarogo, now Caleruega, Spain. 1184 Dominic attends the university in Palencia. 1190 Dominic is appointed to the canonry at Osma. 1203 Dominic accompanies his holy bishop to the Marches of France. 1206 On the feast of Saint Mary Magdalen, Saint Dominic has a vision. 1207 Bishop Diego dies and Saint Dominic takes charge of the small band of preachers. 1208 Servants of an Albigensian count murder a papal legate, giving the heresy more political significance. 1211 Saint Dominic prayers save drowning pilgrimages. 1215 Dominic goes to the Lateran Council. 1216 Pope Honorius III succeeds Innocent III. Dominic set out for Rome to complete the foundation. 1217 The Founder is allowed to return to Toulouse in May of 1217. 1218 By January 1218, Dominic had walked back to Rome. 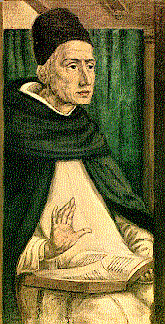 1219 Dominic then travels through France to his Spanish homeland, and then as far as Paris by June of 1219. 1220 The first General Chapter of the Order is held in Bologna around Pentecost, 1220. 1221 Death of St. Dominic – Friday, August 6, 1221, about 6 o’clock in the evening. Grant, we beseech you, Almighty God, that we who are weighed down by the burden of our sins, may be relieved through the patronage of the Blessed Dominic, Your Confessor and our Father. Through Christ, our Lord. Amen. The O Sacred Banquet (O Sacrum Convivium) prayer was composed as an antiphon for the Feast of Corpus Christi by St. Thomas Aquinas. It is also traditionally prayed by Dominicans preceding the hours of the Divine Office, especially if prayed before the Blessed Sacrament, and in other community gatherings. O sacred banquet, in which Christ is received, the memory of His Passion is renewed, the mind is filled with grace, and a pledge of future glory is given to us. O God, who under a wonderful Sacrament hast left us a memorial of Thy Passion; grant us, we beseech Thee, so to reverence the sacred mysteries of Thy Body and Blood, that we may ever feel within ourselves the fruit of Thy Redemption: Who livest and reignest for ever and ever. Amen. Pour upon us, O Lord, the Spirit of Thy love, to make us of one heart, whom, by Thy tender mercy, Thou hast filled with the paschal sacrament. Through Our Lord Jesus Christ, Thy Son, Who with Thee liveth and reigneth in the unity of the same Holy Spirit, God, for ever and ever. Amen. R. Omnem delectamentum in se habentem. Spiritum nobis, Domine, tuae caritatis infunde, ut, quos Sacramentis paschalibus satiasti, tua facias pietate concordes. Per Dominum nostrum Iesum Christum Filium tuum, qui tecum vivit et regnat in unitate eiusdem Spiritus Sancti Deus per omnia saecula saeculorum. Amen. “Thou waterest the hills from above, the earth shall be filled with the fruit of thy works” (Ps. ciii 13). He therefore chose them for the text of his thesis. What distinguishes the Dominicans from other Roman Catholic religious communities? Four specific aspects set us apart, called the Four Dominican Pillars: Prayer, Study, Community, Apostolate. The Holy Sacrifice of the Mass, the Divine Office, the Holy Rosary, private prayer (vocal prayer, mental prayer, and contemplation). Dominicans center our lives on Jesus Christ, the true light, and are moved by the Holy Spirit who radiates God’s healing presence in the world today. We celebrate the Word in daily common prayer, meditation, study, and in the proclamation that is preaching. “In imitation of the Mother of God, who “pondered these things in her heart, our lives are nourished by God’s Word as spoken in Sacred Scripture, celebrated in the Eucharist, and encountered in everyday life. According to the desire of St. Dominic, the solemn and common celebration of the liturgy must be maintained among the principal duties of our vocation. In the liturgy, especially in the Eucharist, the mystery of salvation is present and at work, a mystery in which we share and which we contemplate and proclaim in preaching to others so they may be incorporated into Christ through the sacraments of faith. In the liturgy, together with Christ, we glorify God for the eternal plan of the Divine and for the wonderful order of grace. We intercede with the Father of mercies for the entire Church as well as for the needs and the salvation of the whole world. Therefore, the celebration of the liturgy is the center and heart of our whole life, whose unity especially is rooted in it. Each Dominican is called to balance in his own life the two dimensions of our life, the contemplative and the active. The balance is something for which we continually strive, not something that we achieve once and for all. Sacred Scripture, the Lives of the Saints, Church documents, the history of the Dominican Order, etc. St. Dominic made study an essential part of the “Sacred Preaching.” This was no small innovation in the thirteenth century when most of the clergy were uneducated. St. Dominic sent the friars to the great universities of his time to study, to preach, and to establish places of learning. This dedication to study and teaching continues today. The primary object of Dominican study is the Word of God, which comes to us through Scripture & Tradition, is interpreted authoritatively by the Church’s Magisterium, and Whose fullest manifestation is the very Person of Christ Himself. What we might call the secondary object of Dominican study does not differ in content from the Truth Who is Christ, but it differs in its mode of discovery. Insofar as creation, the accomplishments of human genius and even other religions all reflect the light of the Gospel, these too are profitable means though which the wise and zealous student can come to know more profoundly the Author of all that exists. Hence, both the entire created order as well as “the revelation of the mystery kept secret for long ages but now manifested through the prophetic writings” lie open to the discerning mind of the studious friar. The purpose of Dominican study is to make us useful to the souls of our neighbors. As distinct from mere curiosity, it is a spiritual work of mercy aimed at facilitating a more effective communication of the truth that saves. While knowledge can certainly be sought for its own sake, study is all the more noble and virtuous when one is motivated by the dual command of love of God and love of neighbor. Living a sacramental life in the Church, living in community in our monthly gatherings, special events, etc. We live together in large (as many as 30) and small (as few as 2 or 3) communities. The basic idea of community is not just people living together under one roof. Rather, community living is about the willingness to share our lives with one another. For Dominicans, the communal dimension of our religious life challenges to us to be of “one mind and one heart in God.” Profession into the Order of Preachers includes the promise to hold all things in common. We live together and pray together and share a common vision in the ministry of Preaching. It was St. Dominic’s desire to imitate the apostolic poverty of Jesus and the early church, so “we call nothing our own.” As Dominicans, we share our blessings with the rest of the world. We live a vowed life, that is, we make public promises to live according to the ideals counseled by Jesus. Our vow of poverty calls us to live a simple life, free from the need to possess many things. Our vow of chastity is a deliberate choice on our part not to limit our life to a spouse and family, but to allow ourselves to be witnesses to the unlimited love of God. Our vow of obedience puts us at the service of the Church, free from the need to always have the last word about what we will do and where we will live. The vowed life is a challenge, but an exciting and fulfilling challenge. Preaching through evangelization, catechesis, teaching, serving, etc. As the “O.P.” after our name suggests, preaching is at the heart of Dominican life. In fact, we were founded to be “useful to the souls of others,” and we make ourselves useful primarily through our ministry to the Word of God. Our common life, our study and our prayer are all geared to support the vocation of a preacher. For us preaching takes many forms. We preach from the pulpit during liturgy and at retreats, but we also consider our teaching and various kinds of pastoral care to be ways in which we bring the healing Word of God to bear on the lives of those we serve. Our preaching ministry takes us to parishes, university campuses, retreat centers and sometimes even to food pantries, shelters for the homeless and other places where people are impoverished literally as well as spiritually. Dominican Spirituality: Principles and Practice by William Aquinas Hinnebusch, OP is an excellent resource for understanding Dominican spirituality. He lays out a basic understanding of the Dominican charisms, namely that Dominican life is contemplative, apostolic, liturgical, doctrinal, fraternal, and sacrificial. Saint Dominic integrated “the assiduous study of divine truths” with monastic observances as the structure of the Order in addition to the solemn celebration of the Divine Office and the religious vows of poverty, chastity, and obedience. Lay Dominicans live out the charisms of the Order by incorporating the Four Pillars into their regular life. The Dominican Order also has a special love for and devotion to the Blessed Virgin Mary, especially under her title of Our Lady of the Rosary. If this sounds like you, perhaps you are being called to the family of St. Dominic! Dominican Principles of Spirituality by Pie Regamey, O.P. Getting to know one another: Above all else, this first step allows the candidate to get to know the Order better. This step is normally conducted through our regular meetings. We will help the candidate discern whether or not he or she is made for Dominican life. If there is a positive response at the end of this step, the candidate will be invited to proceed to the next step. Inquiry Period: One must be Catholic for at least two years before beginning the inquiry period. Through a series of classes over the course of one year, our group presents an overview of what it means to be a Dominican. As this period of formation ends, the candidate may decide to request admission to the Order. Novitiate: The duration of the novitiate is twelve months. The novitiate begins with the Dominican Order recognizing the candidate as a member of the Order. This is a more formal formation period in the life of a fraternity member. This period includes diverse activities: the study of the life of St. Dominic and other great Dominican figures; the study of the Constitutions, the history of the Order, and the Rule of the Fraternities of St. Dominic; and the general practice of the commitments of a lay Dominican (e.g., daily Mass, Morning and Evening Prayer from the Liturgy of the Hours, daily Rosary). Simple Profession: As the novitiate ends, candidates and the Order make a decision as to whether the candidate should make a commitment as a lay Dominican. Temporary profession is a commitment to live according to the Rule of the Fraternities of St. Dominic for a period of three years. Formation in Dominican life and spirituality continues during this time. At the end of this period, the candidate and the Order decide if the candidate is prepared to make final or permanent profession. Final Profession: When the decision is reached to move ahead and make final profession, the individual makes a commitment to live according to the Rule of the Fraternities of St. Dominic for the rest of his or her life. On-going Formation: Dominicans are particularly committed to on-going formation both in the chapter and individually. Even though one has made a permanent commitment to be a Dominican, on-going study continues in the area of Dominican spirituality, the Scriptures, the teachings of the Church, etc. Dominicans are always concerned about growing in understanding of both their faith and their Dominican vocation. The Dominican Laity originated in its present form with the promulgation of the first Rule under Munio de Zamora, Master of the Order in 1285. The spiritual origin of the Laity resided within the penitential movements associated with Saint Dominic, who gathered around himself groups of Laity for apostolic work and spiritual and material defense of the Church. The Laity has existed (under various names) as long as the Dominican Order itself, and has always performed specific functions and collaborated closely with the other branches of the Dominican Family. The next logical question to ask is: What must I do to gain all these benefits? (please remember that these items are not binding under sin). To fulfill the obligation of daily prayer a tertiary should pray the Liturgical Office and five decades of the Rosary. Fasting on the vigil of the feasts of St. Dominic, St. Catherine of Siena and the Holy Rosary insofar as this may be possible. – from Fr. Rubba, O.P. This article on the Miraculous Image of the Madonna of San Sisto was originally published by the Dominican Nuns of Mt. Thabor. 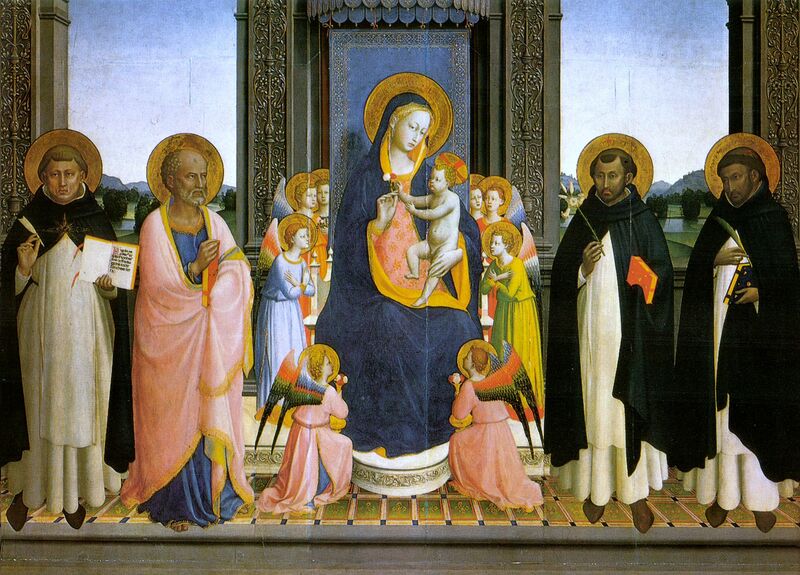 Before the masterful frescoes of Blessed Fra Angelico graced the cloister of San Marco, the Order of Preachers (Dominicans) possessed an artistic work of great character and heritage in the miraculous image of the Madonna of San Sisto in Rome, Italy. This icon of Our Lady was thought during the Middle Ages to have been designed by Saint Luke the Evangelist and to have been painted by angels. Legend held that a holy man from the East brought it to Rome. There it was acquired by three brothers who were exiles from Constantinople, presumably because their adherence to orthodox Christianity, ran into conflict with an outbreak of monophysitism or iconoclasm. The image was placed in the Church of Santa Agata in Turn outside the Appian Way, which, in honor of the icon, became known as alternatively, Santo Maria in Turn and Santa Maria in Tempulo. Confirming parts of this medieval legend, modern historical study has indicated that this Madonna is of Byzantine origin and was venerated at least by the end of the fifth century. When Saint Dominic was charged by Pope Honorius III to establish a reformed community of nuns at San Sisto in Rome, one of the communities from which nuns were voluntarily drawn was the monastery at Santa Maria in Tempulo. St. Dominic lavished his attention upon the nuns of Santa Maria, preaching to them and giving them spiritual direction. It was to each of these same women in 1219 that St. Dominic brought wooden spoons which he had carried on a journey from Spain. At that same time, he received the promise of the nuns that they would enter the new community of San Sisto. However, the mere possibility of the nuns moving from their monastery into a stricter community caused their relatives and friends to protest vociferously. After further entreaties from St. Dominic, most of the nuns agreed to join the new community of San Sisto. The nuns placed one caveat on their promise: that the miraculous image of the Madonna in Santa Maria in Tempulo should also come with them. This was no ordinary request. Legend had it that in the tenth century Pope Sergius III tried to move the painting into the John Lateran Church, but it had returned miraculously to its original home. God seemingly wanted the painting to remain in Santa Maria in Tempulo. St. Dominic was not daunted by the challenge. On the First Sunday of Lent, February 28, 1221, Our Holy Father gave the habit and received in his hands the profession of the nuns entering San Sisto. During the following night, St. Dominic carried the miraculous image of the Madonna to its new home at San Sisto. The painting did not fly back on its own accord, thus bestowing the divine seal of approval to St. Dominic’s foundation. The miraculous Madonna remained at San Sisto until 1575, when it was transferred to San Dominico and Sisto on the Quirinal where the nuns had relocated upon the urging of Pope Saint Pius V. After the monastery became the home of the Angelicum, the image was under the care of the Dominican friars for a time. In 1931, however, the image was placed in Santa Maria del Rosario e della Febbre a Monte Mario where the nuns had moved into a new monastery. The image was restored by Dr. Carlo Bertelli in the 1950’s. On Saturday, September 27th the Charlotte Lay Dominicans – Our Lady of Perpetual Help Group – welcomed 4 members into the novitiate at St. Thomas Aquinas Catholic Church. At this special ceremony one member made Temporary Promises, and another their Final Promises. This was a very special time for our group as it was the first final professed member since the Dominican Laity started in Charlotte 5 years ago. Special thanks to Fr. Kauth, our Spiritual Advisor, and also a member of the Dominican Priestly Fraternities. Portion of LifeSiteNews 40-minute video interview in Rev. Wojciech Giertych’s residence in the papal palace in Vatican City.